Nifty opened flat to positive and stayed in a very small range of 30 points for the entire session but closed in green after 5 negative days to close at 6089.50, a small gain of 15.80 points. On a week on week basis the index lost huge 177.25 points or around 2.83%. The broader market was strong, with 921 advances to 487 declines. Best support for the series is around 6000 Level. Call option 6100-6500 added 16.11 lacs huge amount of OI with profit booking seen at 6600 and above strike prices. Put option 6100-5600 added 34.60 lacs huge amount of OI with small short covering seen at 6200 and above strike prices. 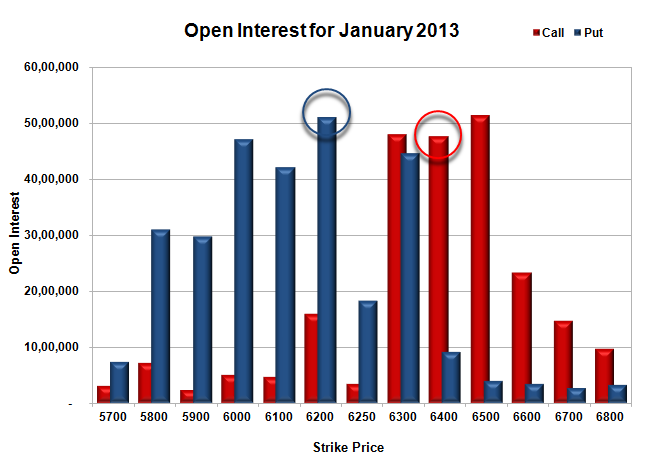 Nifty Open Interest is at 1,62,28,150 up by 2,72,300, with increase in price, most probably long build-up. 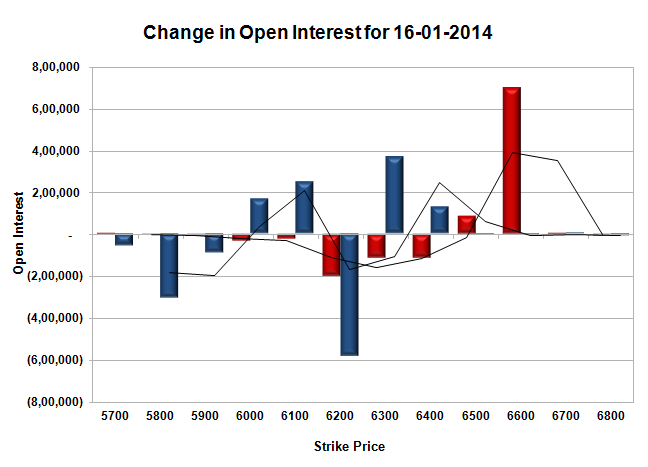 Bank Nifty Open Interest is at 18,37,725 down by 16,725, with increase in price, most probably short covering. FII’s sold huge 4.30 lacs Futures, mostly short build-up, as their net OI increased by 16983 contracts (includes 54267 longs and 62858 shorts for the day) and the average price per contract comes to around 6017.98. FII’s future open contract as on date is 395362. PCR Open Interest (Volume) is at healthy 1.336. 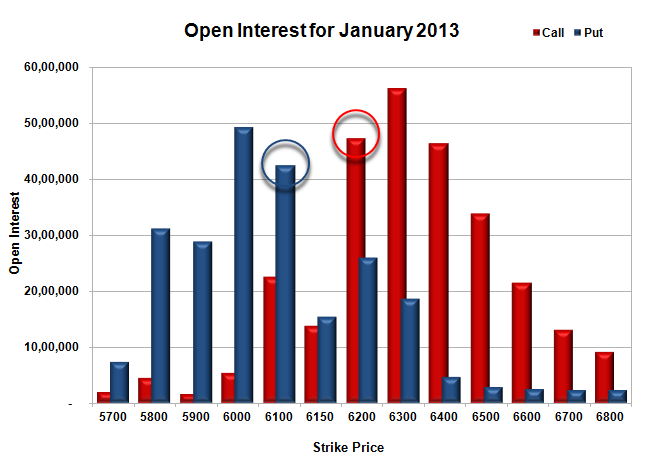 Initial and best support at 6000, with highest OI of 57.54 lacs and below that at 5900 with huge OI of 35.60 lacs. Initial resistance at 6200, with huge addition for the day at 5.95 lacs and above that at 6300, with OI of 31.69 lacs. Day Range as per Option Table is 6035 - 6139 and as per VIX is 6036 - 6143 with 6000 as the Pivot. Nifty opened weak on the back of bad global cues and stayed weak for the better part of the day and saw some Expiry short covering rally towards the end but still closed red at 6073.70, a huge loss of 46.55 points. The broader market was very weak, with just 339 advances to 1082 declines. Best support at the start of the series is around 6000 Level. Call option 5700-6400 added 29.98 lacs huge amount of OI with profit booking seen at 6700 and above strike prices. 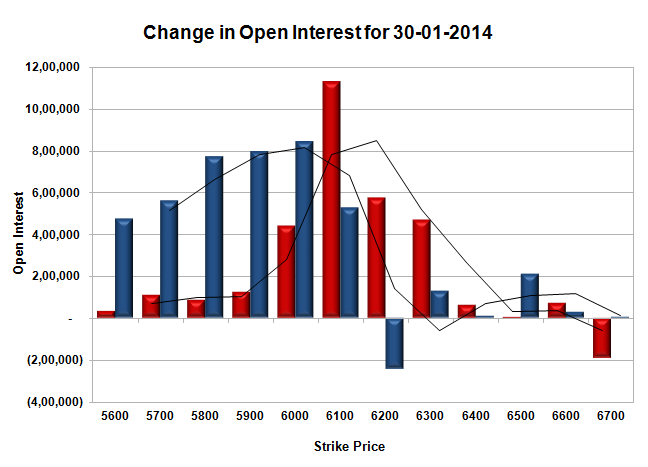 Put option 6100-5600 added 39.66 lacs huge amount of OI with short covering seen at 6200 strike price. 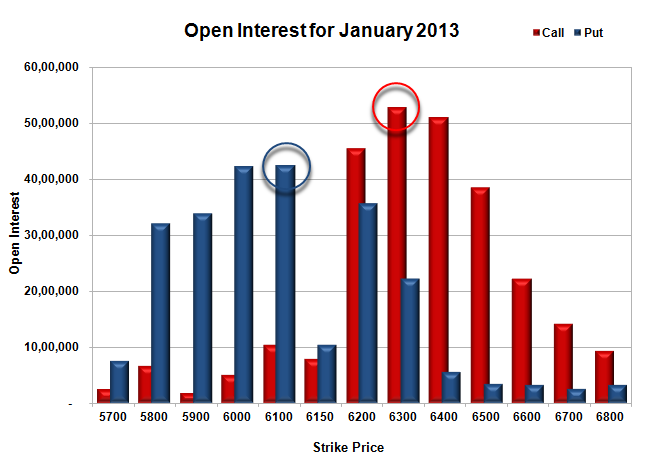 Nifty Open Interest is at 1,59,55,850 up by 17,49,850, with decrease in price, mostly roll-over from previous series. Bank Nifty Open Interest is at 18,54,450 up by 7,05,275, with decrease in price, mostly roll-over from previous series and huge short build-up. FII’s sold huge 15.21 lacs Futures, mostly long liquidation, as their net OI decreased by 171112 contracts (includes 132073 longs and 162492 shorts for the day) and the average price per contract comes to around 6002.54. FII’s future open contract as on date is 378379. PCR Open Interest (Volume) at start of series is at 1.267. 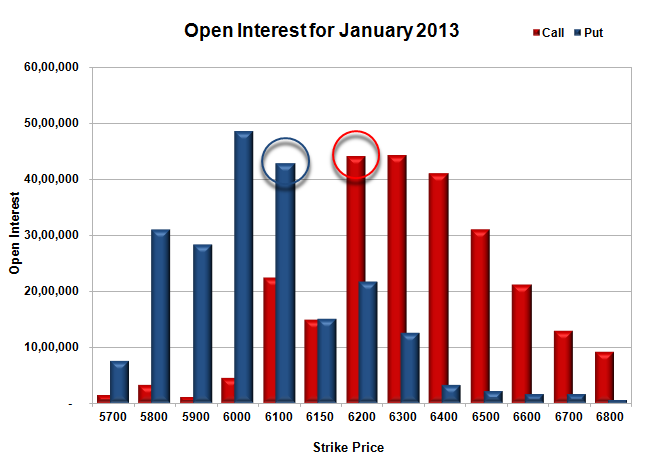 Initial and best support is at 6000, with highest OI of 47.99 lacs and below that at 5900 with huge OI of 28.64 lacs. Initial resistance at 6200, with huge addition for the day at 5.72 lacs and above that at 6300, with OI of 30.80 lacs. Day Range as per Option Table is 6010 - 6122 and as per VIX is 6019 - 6129 with 6061 as the Pivot. Nifty opened positive and stayed in the green for the better part of the day, but a small sell-off around the last hour saw the index down towards 6100 level and closed in the Red at 6120.25, a small loss of 6.00 points. The broader market was also weak, with 656 advances to 758 declines. Best support for the expiry is at 6000 Level. 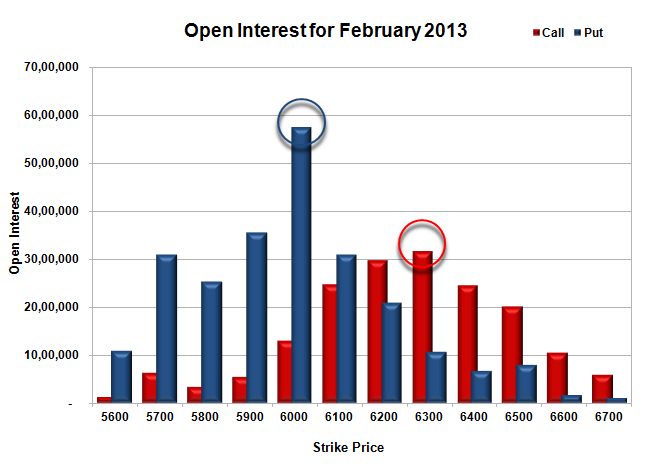 Call option 6150 added 1.04 lacs of OI with profit booking seen at 6300 and above strike prices. 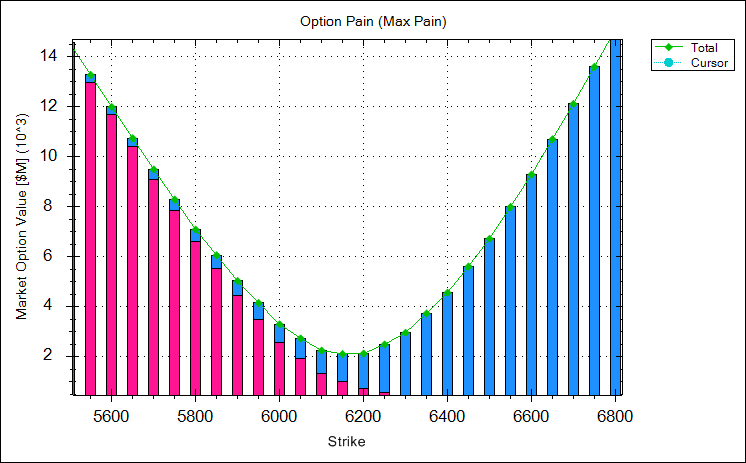 Put option 6100 added 0.22 lacs small amount of OI with huge short covering seen at 6200 and above strike prices. Nifty Open Interest is at 86,92,150 down by 21,09,400, whereas Feb series added 18.62 lacs, with small decrease in price, mostly roll-over with small long liquidation. Bank Nifty Open Interest is at 12,15,125 down by 3,65,800, whereas Feb series added 2.41 lacs, with decrease in price, mostly rollover with huge long liquidation. FII’s sold huge 4.45 lacs Futures, mostly long liquidation, as their net OI decreased by 20627 contracts (includes 126643 longs and 135542 shorts for the day) and the average price per contract comes to around 6055.85. FII’s future open contract as on date is 549491. PCR Open Interest (Volume) is just up from yesterday at 0.825. 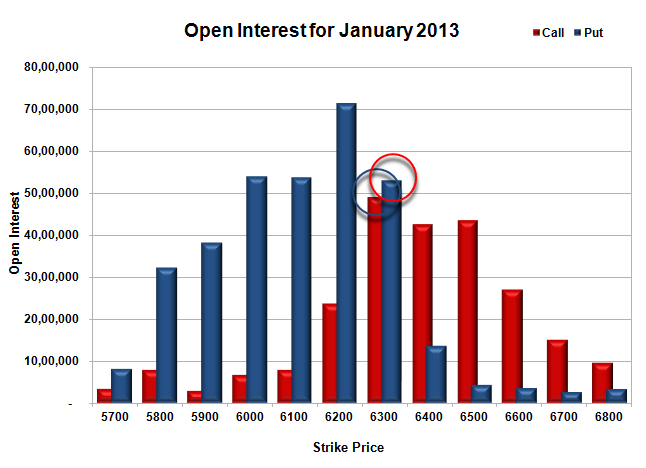 Initial support at 6100, with huge OI of 42.76 lacs and below that at 6000 with highest OI of 48.52 lacs. Initial resistance at 6150, with huge addition for the day at 1.04 lacs and above that at 6200, with OI of 44.10 lacs. 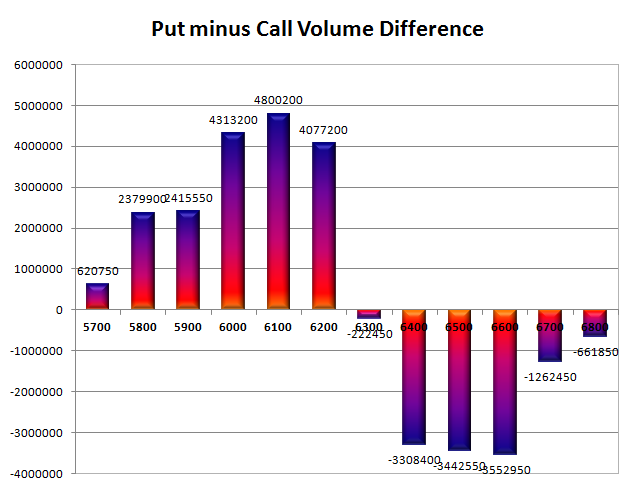 Expiry Day Range as per Option Table is 6077 - 6183 and as per VIX is 6062 - 6178 with 6134 as the Pivot. Nifty opened flat and stayed positive till the RBI Governor came out with the Credit Policy and increased Repo rate by 25 bps to 8%, which saw the index nosedive by 80 points within minutes to the lows of the day at 6085. Small pullback saw the index close at 6126.25, a small loss of 9.60 points. The broader market was just positive, with 709 advances to 673 declines. Best resistance for the series is now at 6300 Level. Call option 6100-6300 added 23.18 lacs huge amount of OI with profit booking seen at 6400 and above strike prices. Put option 6150-6000 added 12.10 lacs small amount of OI with huge short covering seen at 6200 and above strike prices. Nifty Open Interest is at 1,08,01,550 down by 18,50,300, whereas Feb series added 37.02 lacs, with decrease in price, most probably 100% roll-over with huge short build-up in next series. Bank Nifty Open Interest is at 15,80,925 down by 1,83,975, whereas Feb series added 0.97 lacs, with decrease in price, most probably rollover with huge long liquidation. FII’s sold small 0.27 lacs Futures, mostly short build-up, as their net OI increased by 44572 contracts (includes 264639 longs and 265185 shorts for the day) and the average price per contract comes to around 6064.41. FII’s future open contract as on date is 570118. 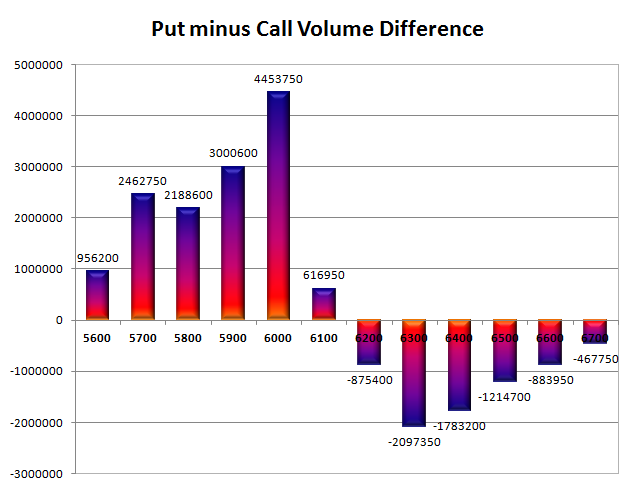 PCR Open Interest (Volume) is around the lowest of the series at 0.793. 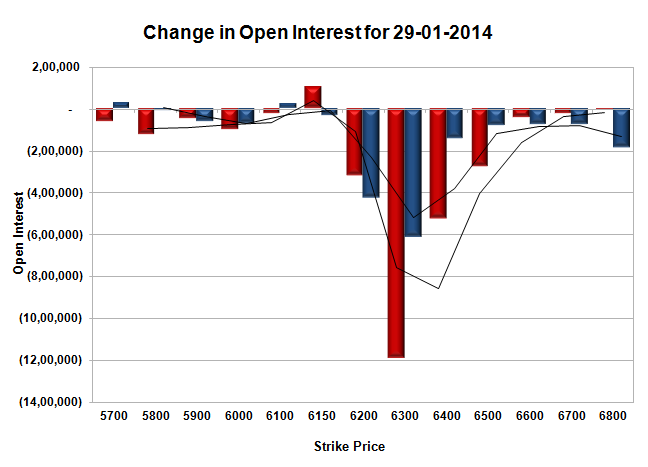 Initial and best support still at 6100, with huge OI of 42.54 lacs and below that at 6000 with OI of 49.25 lacs. Initial resistance at 6150, with huge addition for the day at 5.85 lacs and above that at 6200, with OI of 47.30 lacs. Day Range as per Option Table is 6071 - 6180 and as per VIX is 6069 - 6183 with 6125 as the Pivot. Nifty opened down by more than 80 points and stayed weak throughout the entire session to close around the lows of the day at 6135.85, a huge loss of 130.90 points. The broader market was also very weak, with 221 advances to 1229 declines. Best resistance for the series is now at 6300 Level. Call option 6100-6400 added 51.04 lacs huge amount of OI with profit booking seen at 6500 and above strike prices. Put option 6150, 5900-5800 added 6.99 lacs small amount of OI with huge short covering seen at 6200 and above strike prices. Nifty Open Interest is at 1,26,51,850 down by 32,18,500, whereas Feb series added 37.70 lacs, with decrease in price, most probably 100% roll-over with some short build-up in next series. Bank Nifty Open Interest is at 17,64,900 up by 1,80,600, whereas Feb series added 2.37 lacs, with decrease in price, most probably short build-up in both series. FII’s sold 8.99 lacs Futures, mostly short build-up, as their net OI increased by 12654 contracts (includes 173581 longs and 191559 shorts for the day) and the average price per contract comes to around 6066.11. FII’s future open contract as on date is 525546. 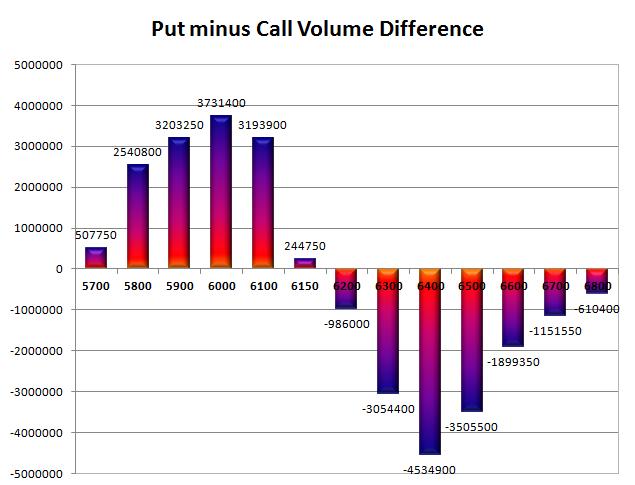 PCR Open Interest (Volume) has gone down below 1 to 0.844. 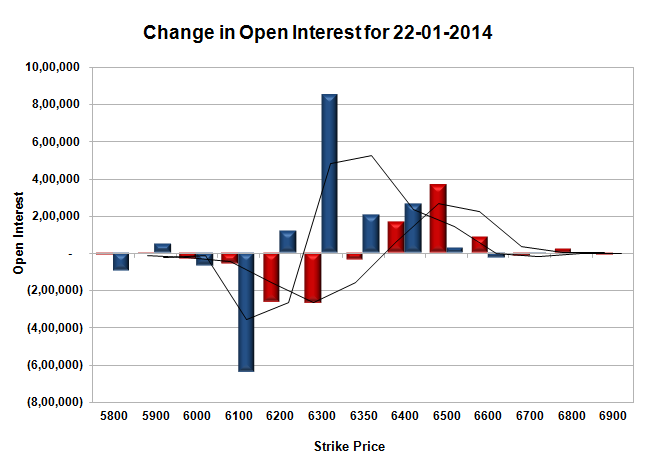 Initial and best support still at 6100, with huge OI of 42.38 lacs and below that at 6000 with OI of 42.33 lacs. Initial resistance right now at 6150, with huge addition for the day at 7.52 lacs and above that at 6200, with OI of 45.52 lacs. 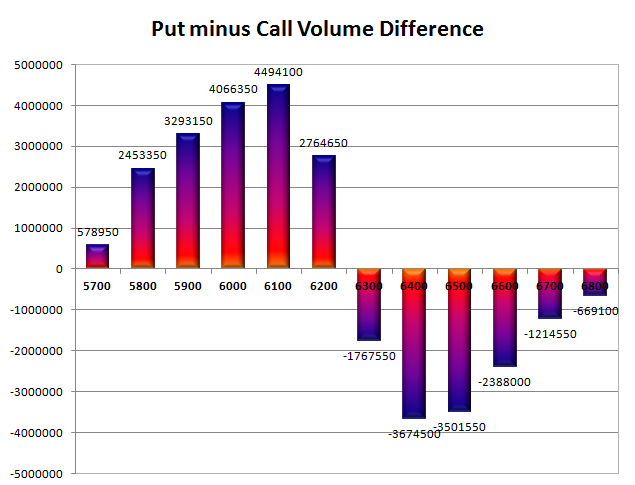 Day Range as per Option Table is 6095 - 6202 and as per VIX is 6076 - 6196 with 6152 as the Pivot. Nifty opened gap-down around 6300 level and after a initial up move towards 6330 saw the Seller take control from thereon to move the index below 6300 initially and then to the close around the lows of the day at 6266.75, a huge loss of 78.90 points. On a week on week basis the index gained 5.10 points or around 0.08%. The broader market was very weak, with 338 advances to 1121 declines. Best resistance for the series is now at 6500 Level. Call option 6250-6300 added 6.95 lacs huge amount of OI with profit booking seen at 6500 and above strike prices. Put option 6250 added 0.91 lacs small amount of OI with huge short covering seen at 6300 and above strike prices. Nifty Open Interest is at 1,58,70,350 down by 13,01,450, whereas Feb series added just 5.30 lacs, with decrease in price, most probably small roll-over with huge long liquidation. Bank Nifty Open Interest is at 15,84,300 up by 5,625, whereas Feb series added 0.77 lacs, with decrease in price, most probably short build-up. FII’s sold 15.09 lacs Futures, mostly short build-up, as their net OI increased by 7287 contracts (includes 69417 longs and 99590 shorts for the day) and the average price per contract comes to around 6204.98. FII’s future open contract as on date is 512892. PCR Open Interest (Volume) has gone down to 1.112. Initial and best support at 6200, with highest OI of 51.00 lacs and below that at 6100 with huge OI of 42.15 lacs. 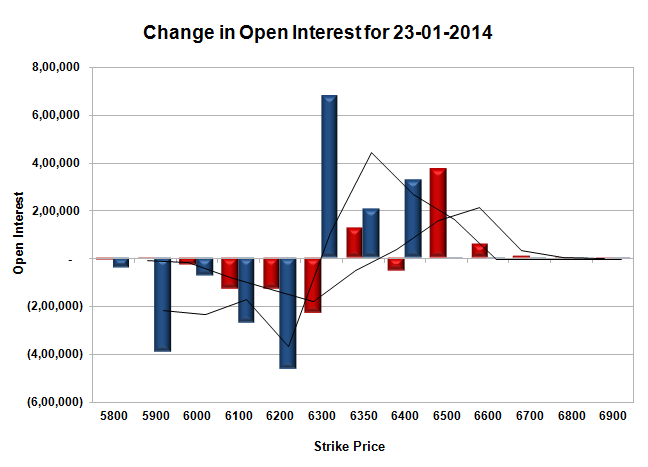 Initial resistance now at 6300, with huge OI of 48.03 lacs and above that at 6400, with OI of 47.69 lacs. Day Range as per Option Table is 6237 - 6330 and as per VIX is 6215 - 6319 with 6287 as the Pivot. Nifty opened weak and stayed within a small range for the first few hours of trade but saw the buyer back around noon to take the index back above the dotted line to close firm at 6345.65, a small gain of 6.70 points. The broader market though was weak, with 612 advances to 825 declines. Best support for the series now up at 6300 Level. 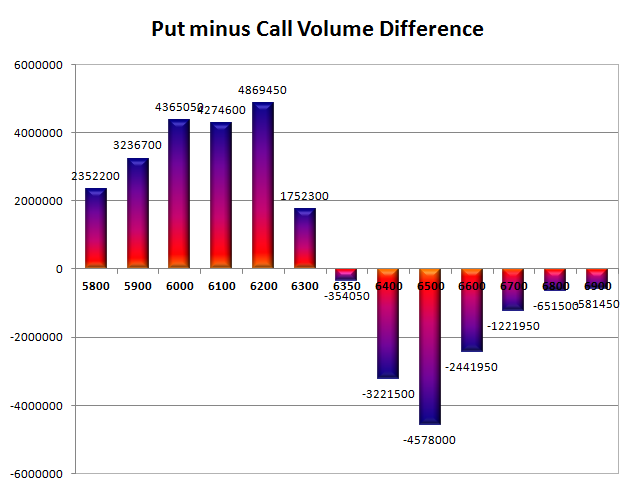 Call option 6350, 6500-6600 added 5.59 lacs huge amount of OI with short covering seen at 6300 and below strike prices. Put option 6400-6300 added 12.13 lacs huge amount of OI with profit booking seen at 6200 and below strike prices. Nifty Open Interest is at 1,71,71,800 down by 3,40,000, whereas Feb series added 6.13 lacs, with increase in price, most probably 100% roll-over with huge long build-up in the next series. Bank Nifty Open Interest is at 15,78,675 up by 21,825, whereas Feb series added 0.43 lacs, with small decrease in price, most probably short build-up. FII’s bought 1.84 lacs Futures, mostly long build-up, as their net OI increased by 3136 contracts (includes 38496 longs and 34822 shorts for the day) and the average price per contract comes to around 6286.14. FII’s future open contract as on date is 505605. PCR Open Interest (Volume) is at 1.274. 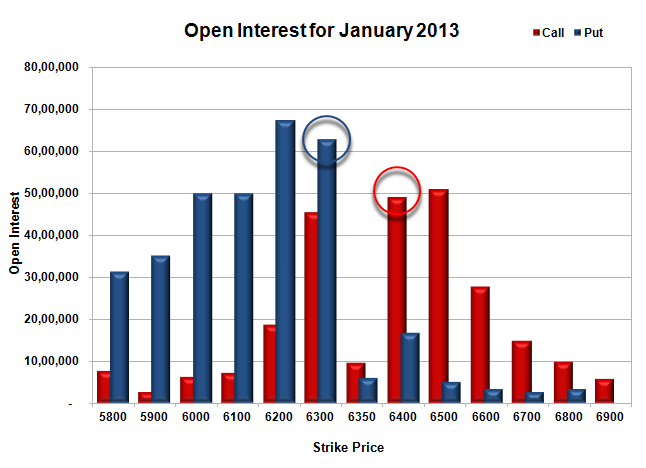 Initial and best support at 6300, with highest OI of 69.65 lacs and below that at 6200 with huge OI of 62.73 lacs. 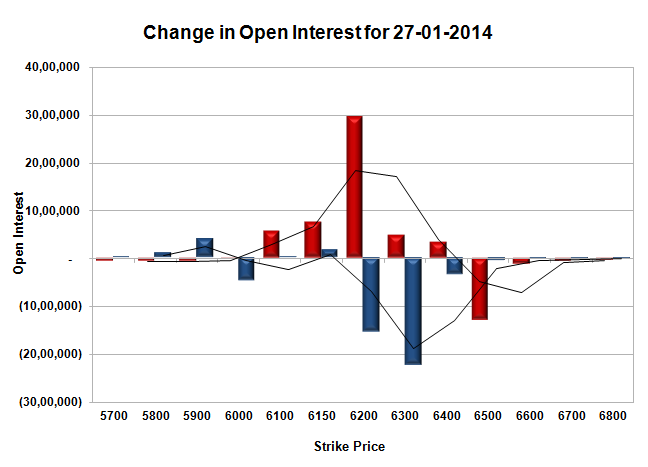 Initial resistance still at 6400, with huge OI of 48.57 lacs and above that at 6500, with OI of 54.53 lacs. 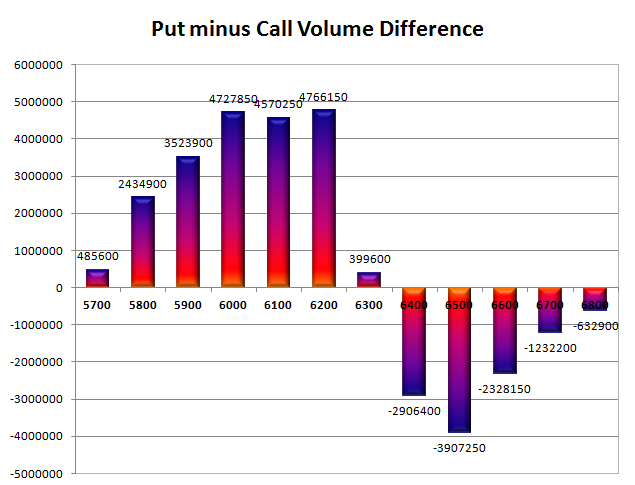 Day Range as per Option Table is 6297 - 6384 and as per VIX is 6294 - 6397 with 6339 as the Pivot. Nifty opened soft and went on to touch the lows of the day around 6287 within the first few minutes of trade. The responsive buyers took control from thereon to move the index back in the green closing at 6338.95, gain of 25.15 points. The broader market was also positive, with 755 advances to 661 declines. Best support for the series at 6200 Level. 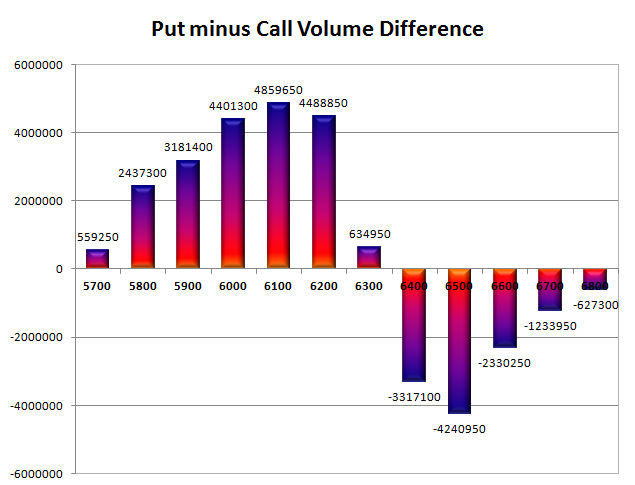 Call option 6400-6600 added 6.17 lacs huge amount of OI with short covering seen at 6300 and below strike prices. Put option 6400-6200 added 14.38 lacs huge amount of OI with profit booking seen at 6100 and below strike prices. Nifty Open Interest is at 1,75,11,800 down by 1,44,250, whereas Feb series added 6.78 lacs, with increase in price, most probably 100% roll-over with huge long build-up in the next series. Bank Nifty Open Interest is at 15,56,850 down by 15,275, whereas Feb series added 0.25 lacs, with increase in price, most probably 100% roll-over with some long build-up in next series. FII’s bought 1.33 lacs Futures, mostly long build-up, as their net OI increased by 16466 contracts (includes 47916 longs and 45254 shorts for the day) and the average price per contract comes to around 6281.78. FII’s future open contract as on date is 502469. PCR Open Interest (Volume) is still around 1.283. 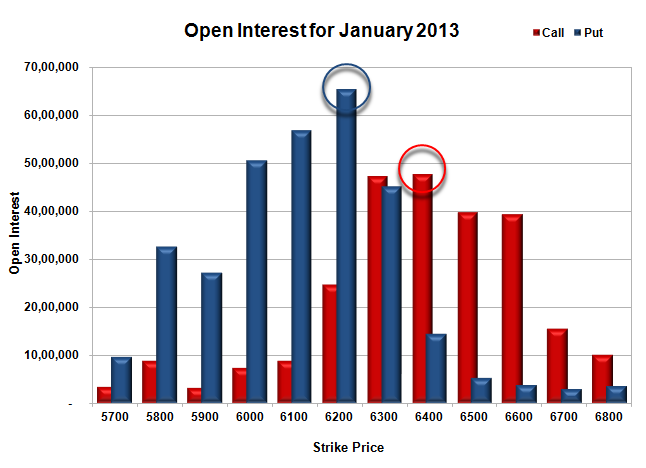 Initial support at 6300, with huge OI of 62.85 lacs and below that at 6200 with highest OI of 67.37 lacs. Initial resistance at 6400, with huge OI of 49.09 lacs and above that at 6500, with OI of 50.81 lacs. 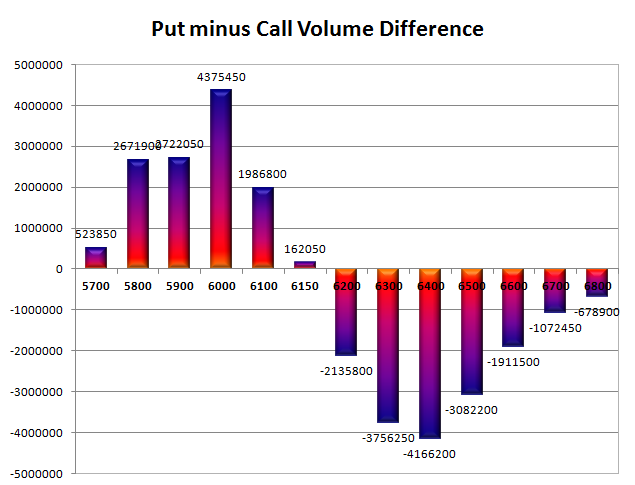 Day Range as per Option Table is 6282 - 6378 and as per VIX is 6286 - 6392 with 6325 as the Pivot. Nifty opened flat to positive and stayed within a narrow range of 32 points for the entire session of trade with Bullish bias and closed at 6313.80, a small gain of 9.85 points. The broader market was also just positive, with 725 advances to 704 declines. Best support still at 6200 Level. 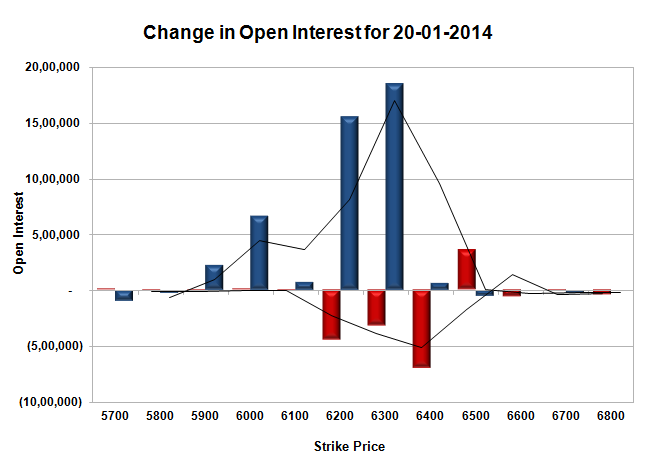 Call option 6400-6500 added 8.35 lacs huge amount of OI with short covering seen at 6200 and below strike prices. Put option 6400-6300, 6100 added 4.75 lacs huge amount of OI with profit booking seen at 6000 and below strike prices. 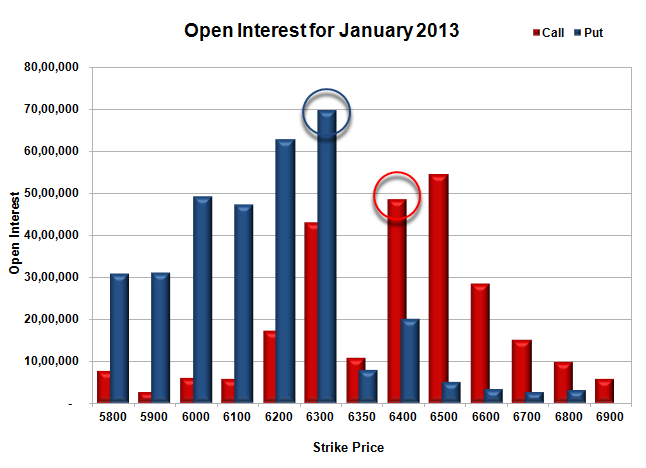 Nifty Open Interest is at 1,76,56,050 up by 5,69,150, with increase in price, most probably huge long build-up. 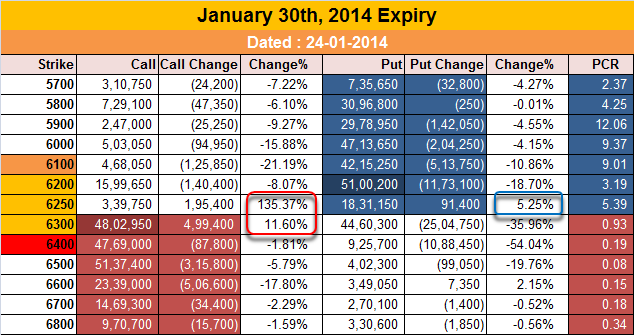 Bank Nifty Open Interest is at 15,72,125 down by 91,175, with increase in price, most probably huge short covering. FII’s bought 1.19 lacs Futures, mostly long build-up, as their net OI increased by 33119 contracts (includes 52534 longs and 50163 shorts for the day) and the average price per contract comes to around 6258.38. FII’s future open contract as on date is 486003. PCR Open Interest (Volume) is still hovering around 1.270. 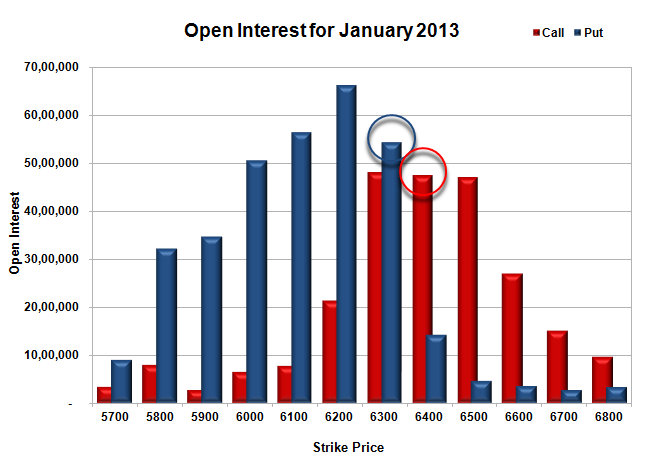 Initial support at 6300, with huge OI of 54.38 lacs and below that at 6200 with highest OI of 66.17 lacs. 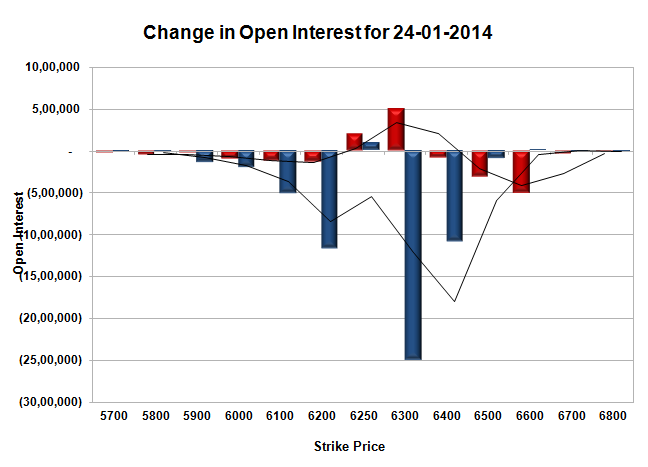 Initial resistance at 6400, with huge OI of 47.41 lacs and above that at 6500, with OI of 47.15 lacs. Day Range as per Option Table is 6268 - 6362 and as per VIX is 6262 - 6365 with 6314 as the Pivot. Nifty opened flat and after an initial dip towards 6240, the responsive buyers took control and closed the index above 6300 to close the session at 6303.95, a huge gain of 42.30 points. The broader market was also positive, with 783 advances to 657 declines. Best support getting better at 6200 Level. 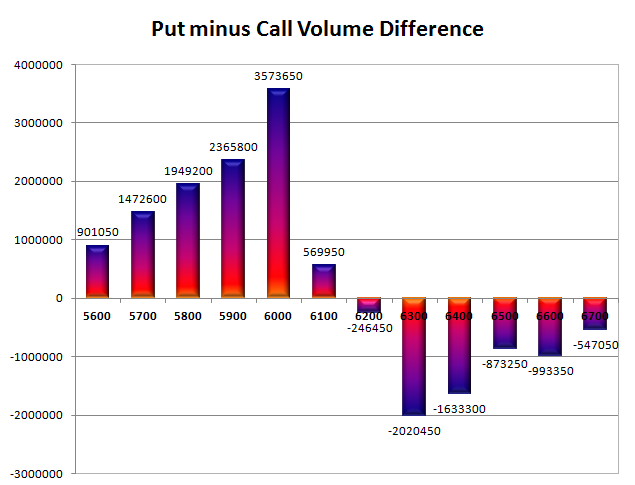 Call option 6500 added 3.56 lacs huge amount of OI with short covering seen at 6300 and below strike prices. Put option 6300-5900 added 43.65 lacs huge amount of OI with profit booking seen at 5800 and below strike prices. 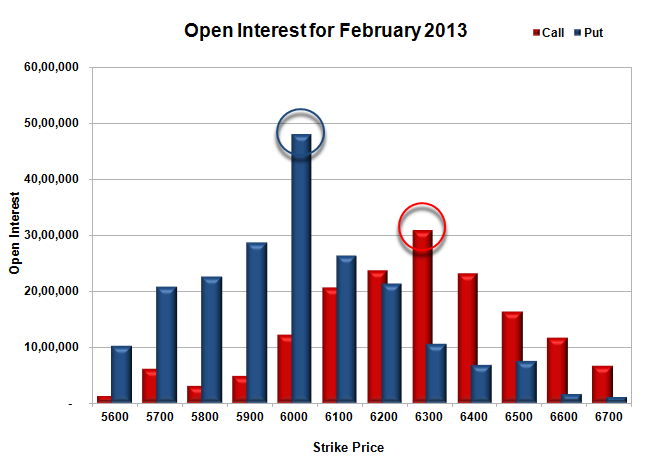 Nifty Open Interest is at 1,70,86,900 down by 8,97,200, with increase in price, most probably huge short covering. 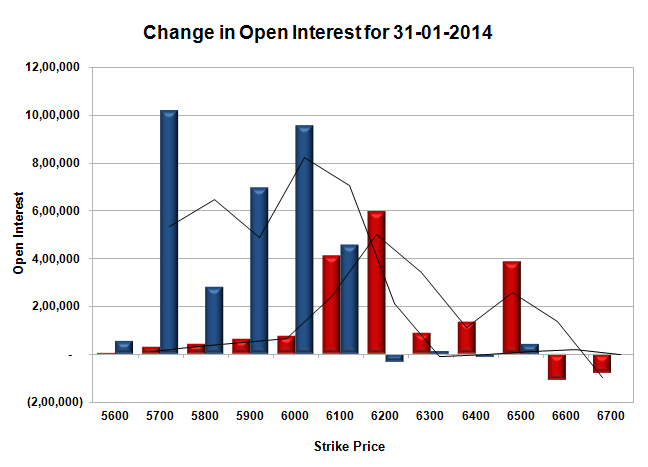 Bank Nifty Open Interest is at 16,63,300 down by 1,24,450, with increase in price, most probably huge short covering. FII’s sold huge 1.62 lacs Futures, mostly long liquidation, as their net OI decreased by 30847 contracts (includes 58587 longs and 61820 shorts for the day) and the average price per contract comes to around 6245.17. FII’s future open contract as on date is 452884. 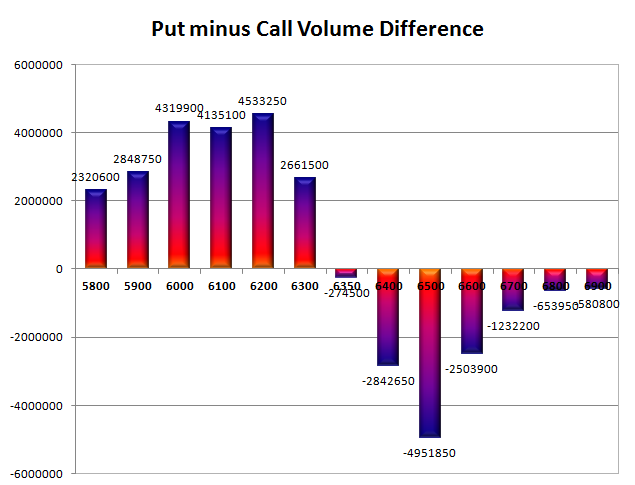 PCR Open Interest (Volume) is around the highest point of the series at 1.299. 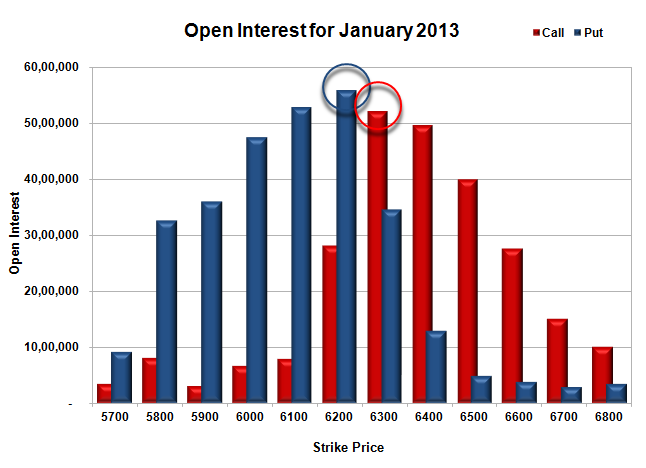 Initial support has moved up at 6300, with huge OI of 52.98 lacs and below that at 6200 with highest OI of 71.35 lacs. 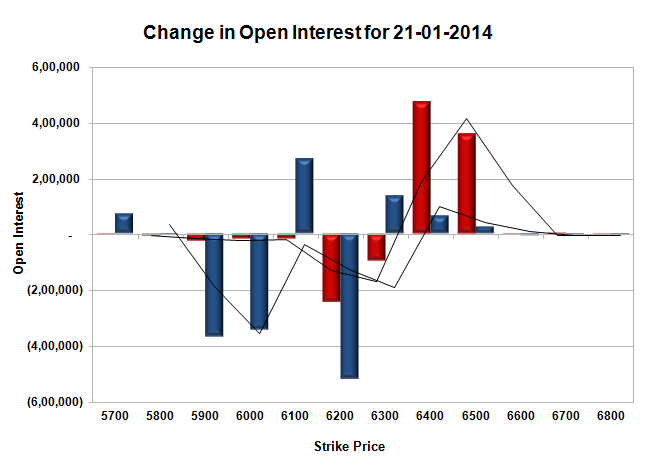 Initial resistance at 6400, with huge OI of 42.66 lacs and above that at 6500, with OI of 43.55 lacs. 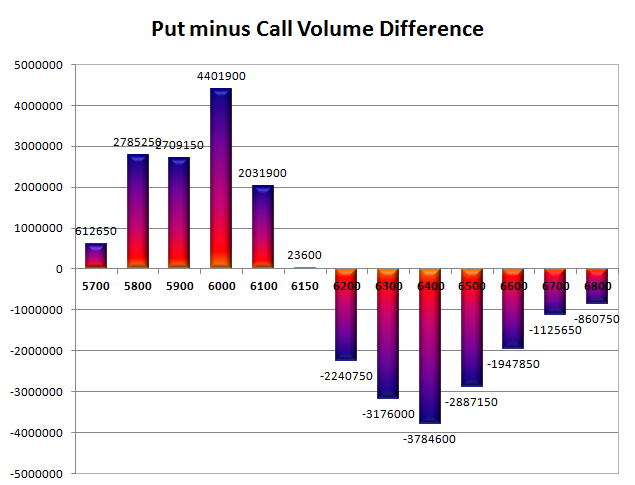 Day Range as per Option Table is 6240 - 6342 and as per VIX is 6253 - 6355 with 6285 as the Pivot. Nifty opened weak and stayed weak for the entire session to close just above the low at 6261.65, a huge loss of 57.25 points. On a week on week basis the index was up by 90.20 points or approx 1.46%. The broader market was also weak, with just 367 advances to 1075 declines. Best support still at 6200 Level. Call option 6200-6400 added 10.47 lacs huge amount of OI with profit booking seen at 6600 and above strike prices. Put option 5900 added 8.71 lacs huge amount of OI with huge short covering seen at 6200 and above strike prices. Nifty Open Interest is at 1,79,84,100 down by 10,41,500, with decrease in price, most probably huge long liquidation. 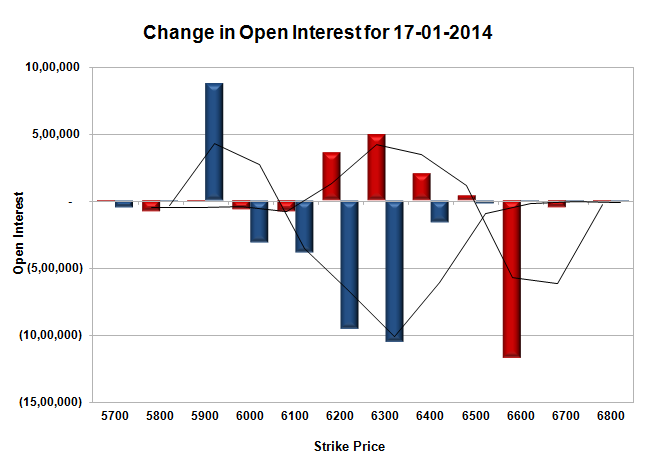 Bank Nifty Open Interest is at 17,87,750 up by 1,08,500, with decrease in price, most probably huge short build-up. FII’s sold huge 3.93 lacs Futures, mostly long liquidation, as their net OI decreased by 8551 contracts (includes 55853 longs and 63718 shorts for the day) and the average price per contract comes to around 6187.41. FII’s future open contract as on date is 483731. PCR Open Interest (Volume) has come down to 1.113. Initial and best support at 6200, with highest OI of 55.82 lacs and below that at 6100 with OI of 52.93 lacs. 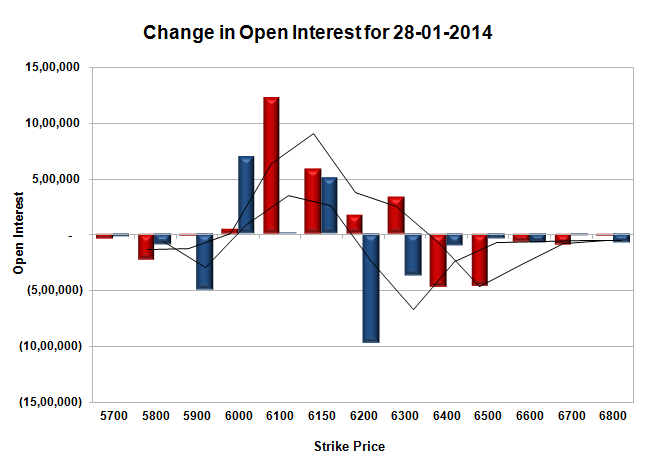 Initial and best resistance at 6300, with huge OI of 52.20 lacs and above that at 6400, with OI of 49.67 lacs. 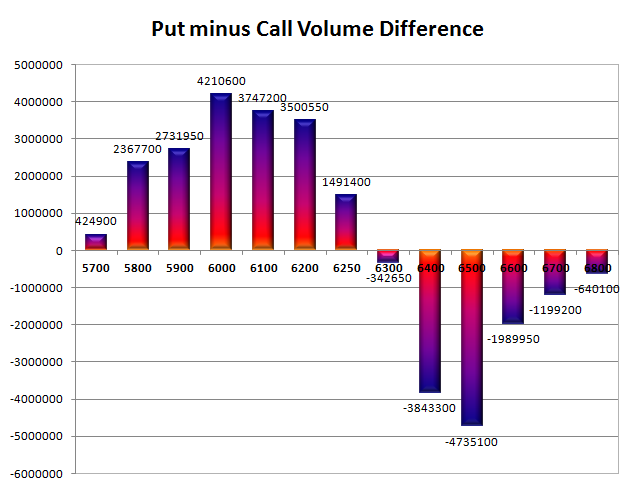 Day Range as per Option Table is 6224 - 6325 and as per VIX is 6211 - 6312 with 6278 as the Pivot.